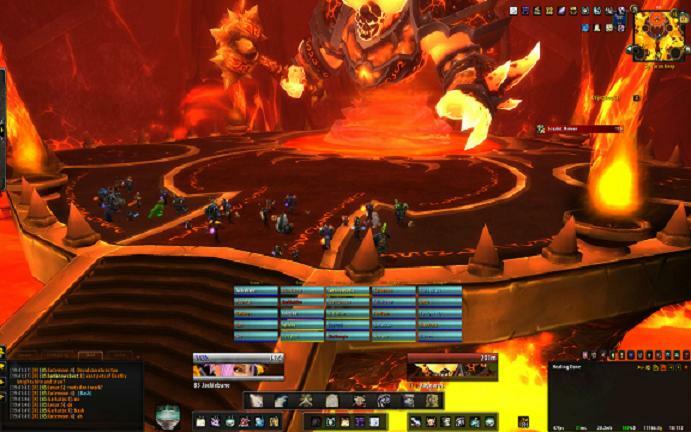 Firelands is going very well for NoQ currently 1/7hc – still steadily holding Realm 1st [25m]. We hope to have Rhyolith H nailed this lockout with some nice shinys for some –not me tho, im so far down the EPGP PR list its not funny ! As expected Shannox Heroic 25 was a walk in the park…almost ridiculously easy. The jump between Shannox H and Rhyolith is very much industrail sized with rhyolith being very RNG…just when u think ur not standing in bad – u are ! – Very movement intensive encounter – sure keeps the healers hearts pumping…. we are 6 healing Ryolith currently, our usual setup is Holydin, Disc Priest, Holy Priest and 3 [yes 3] Druids. Atonement spec just wasnt working for me on this encounter. Granted it did the job of keeping the spark tank up but with almost 150k mana I can afford to drop a lot more shields on the raid to lessen the raid damage some what, therefore the non-smite spec was working much better. 2 points in Veiled shadows for the reduced Shadow Fiend is a must when shield spamming 🙂 I also picked up desperate prayer – ideal for the many times when standing in bad cant be helped and u need to finish that big heal cast on ur tank. [or for the times youre distracted momentarily whilst drinking a glass of wine]…. I do find myself shuffeling talent points around depending on the encounter. Atonement spec feels fairly redundant in this tier apart from on shannox and staghelm which is a shame because I like my gnome wings. Everyone is raving about the super awesome Moonwell Chalice trinket from the Molton Front daily quests, I have this bound up in a macro along with Power Infusion – the combination is awesome if u treat the it like a raid cooldown. Pop this and spam your heart out with Prayer of Healing spam. All those shiny Divine Aegis bubbles will get huge !..particularly useful for Ragnaros if you use the ‘stacking in the midle’ for seeds tactic. Posted on 14/08/2011, in Cataclysm and tagged 4.1, BWD, disc layout, disc priest, firelands, Grace 4.0.6, Healing UI, heroic, moonwell chalice, no quarter, power infusion, prayer of healing, priest, pw:s, ragnaros, rhyolith, shannox, standing in bad, tyrandes favourite doll, wow. Bookmark the permalink. Leave a comment.